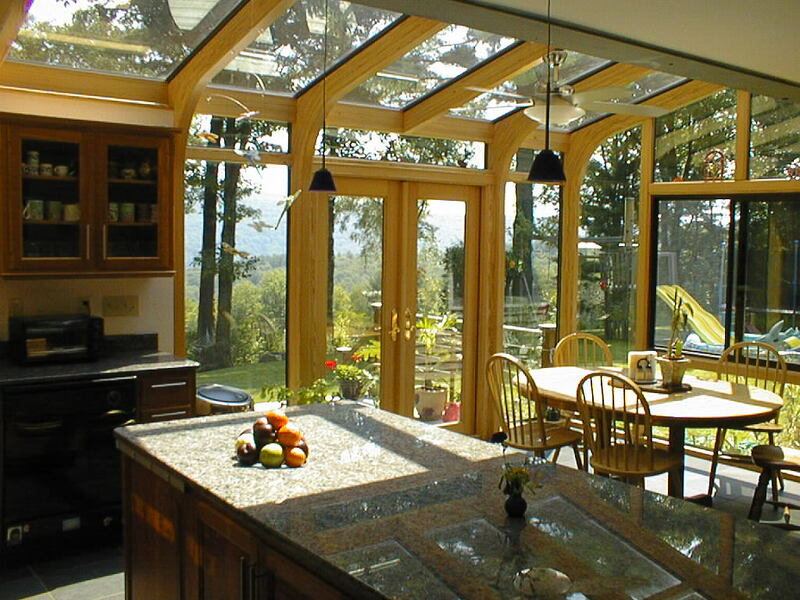 Your dream kitchen will be the centerpiece, showcase room in your house. 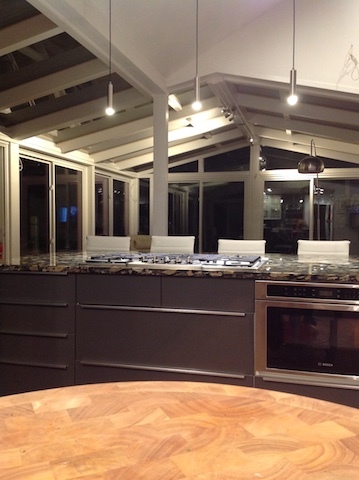 Expanding the kitchen footprint with a bump out addition adds function and versatility to your kitchen and dining areas. 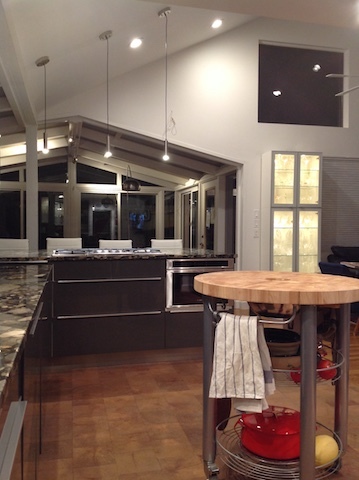 With more room, you can add cabinets, a kitchen island, or even a second oven. 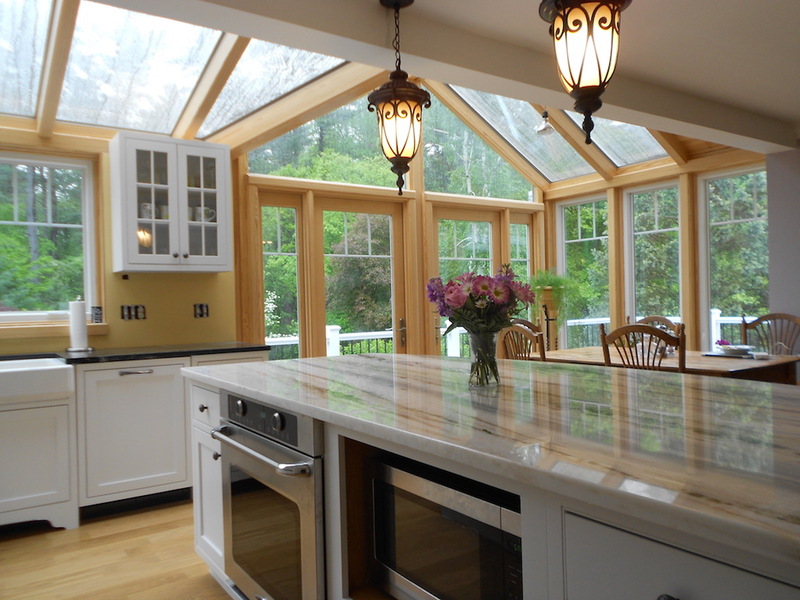 An updated kitchen can add tremendous value to your home and be a great area for family gatherings and entertaining guests. 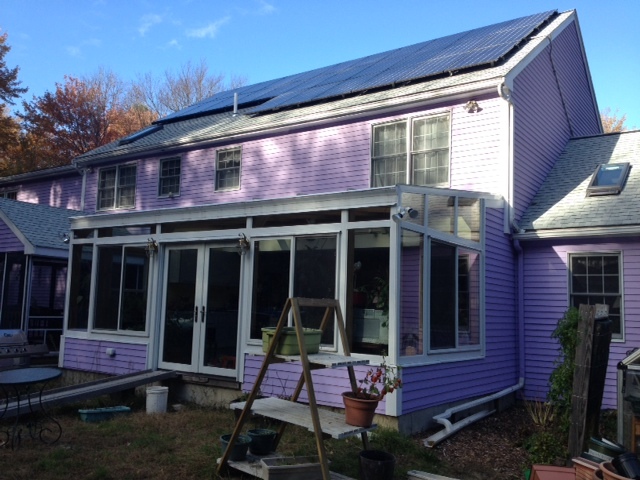 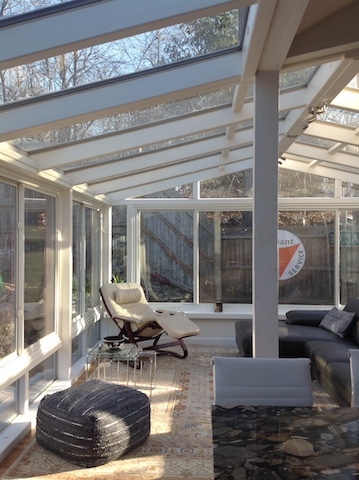 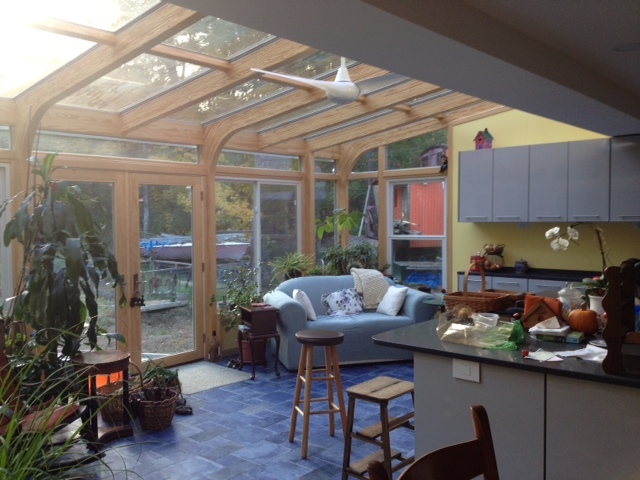 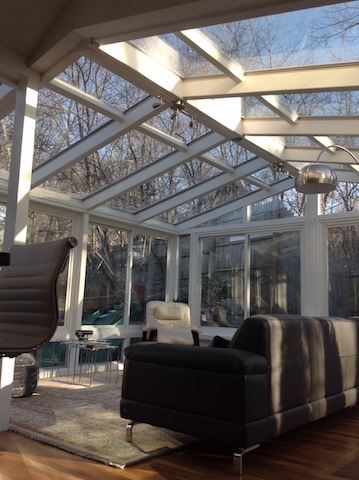 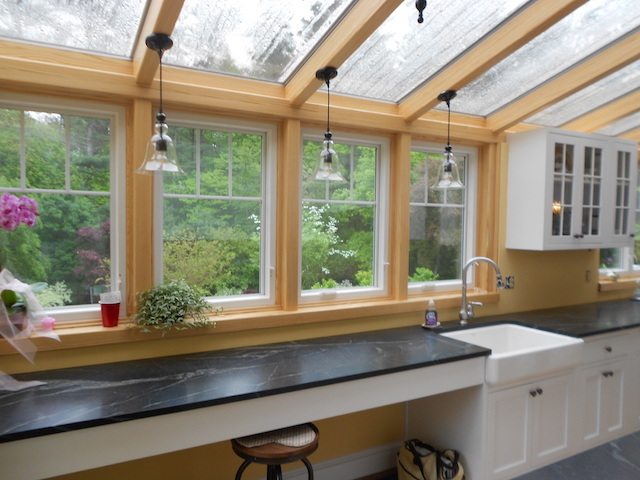 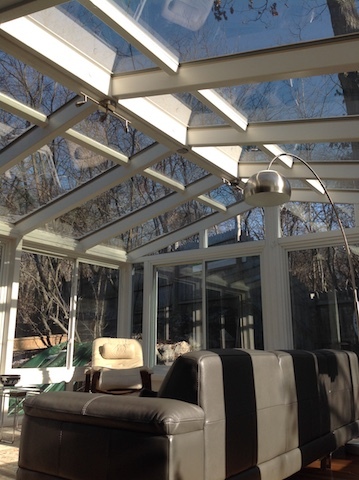 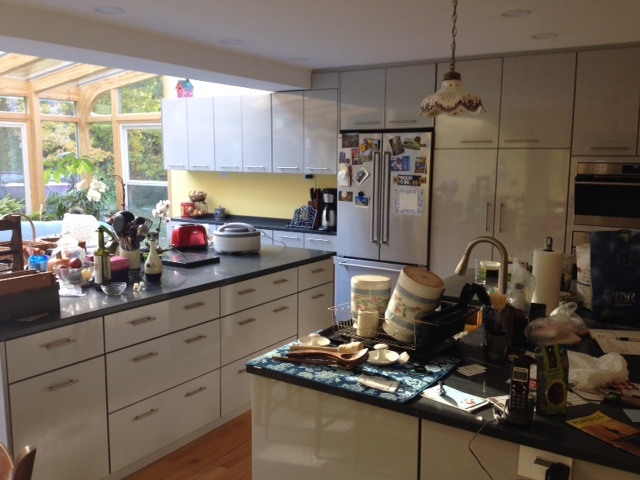 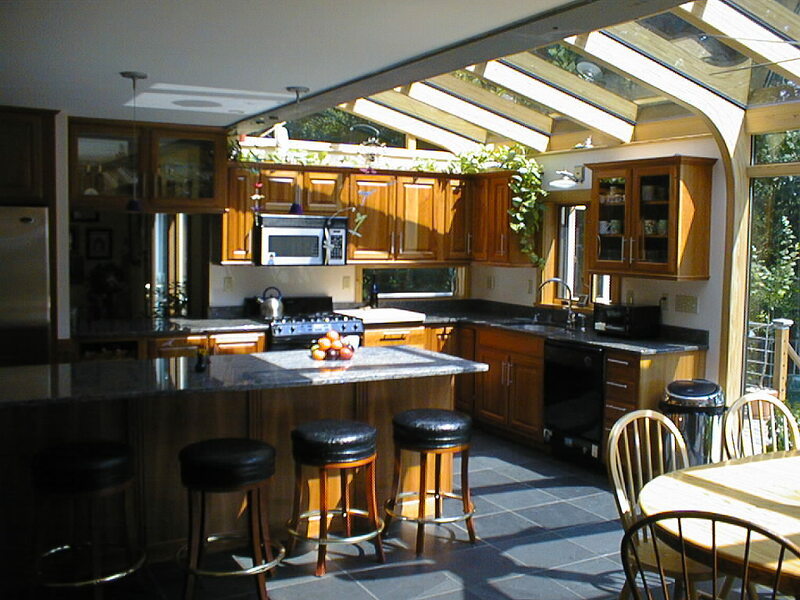 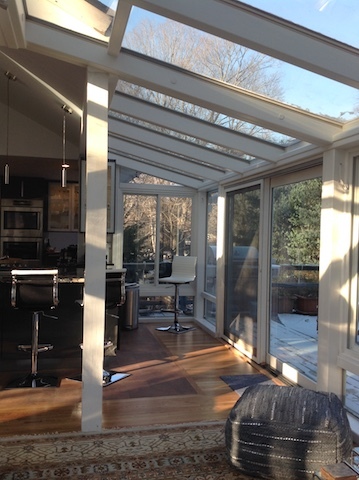 This glass-roof bump out doubled the footprint of a cramped kitchen and provided abundant natural lighting. 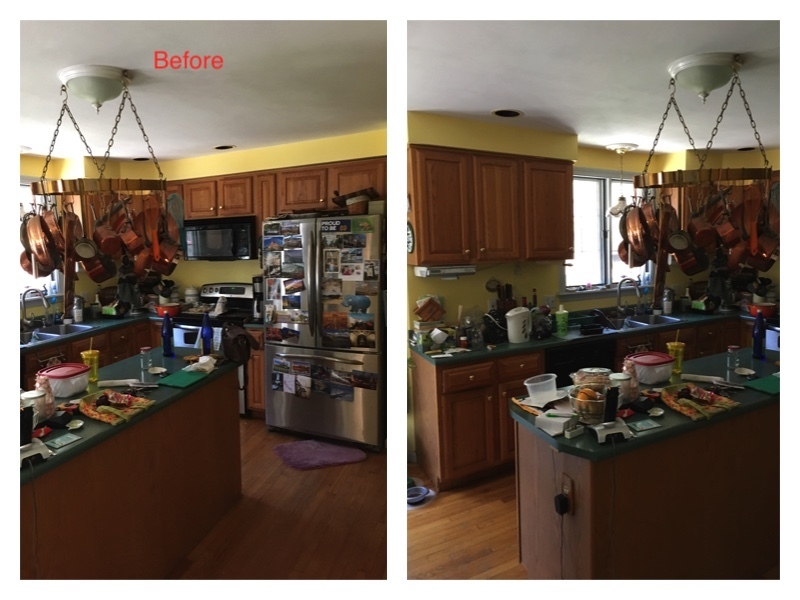 With the extra space, our customer added cabinets, granite countertops, and island/bar stool eating area and a breakfast nook with specular views. 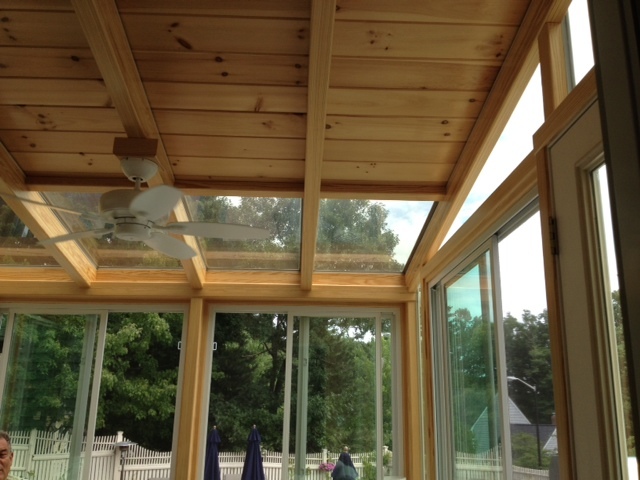 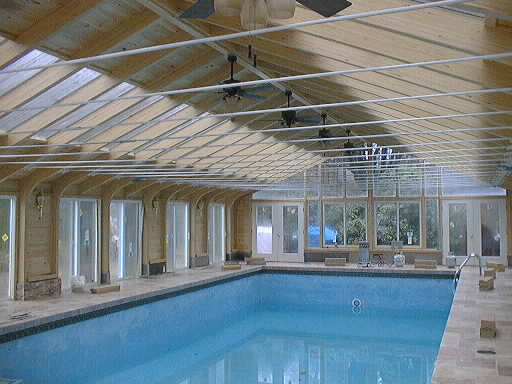 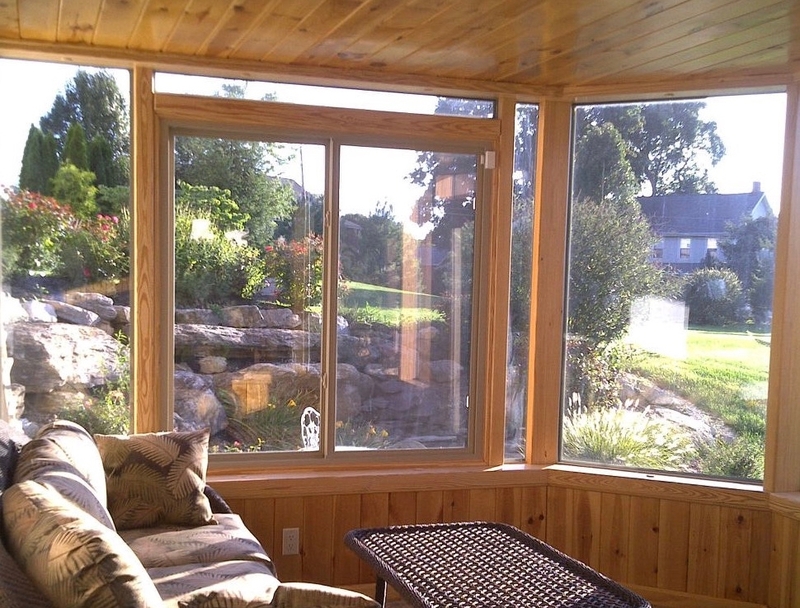 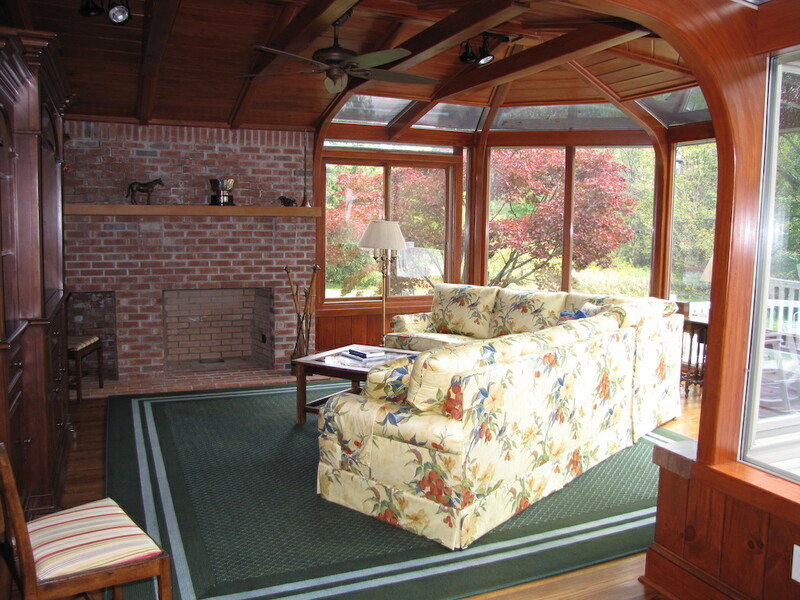 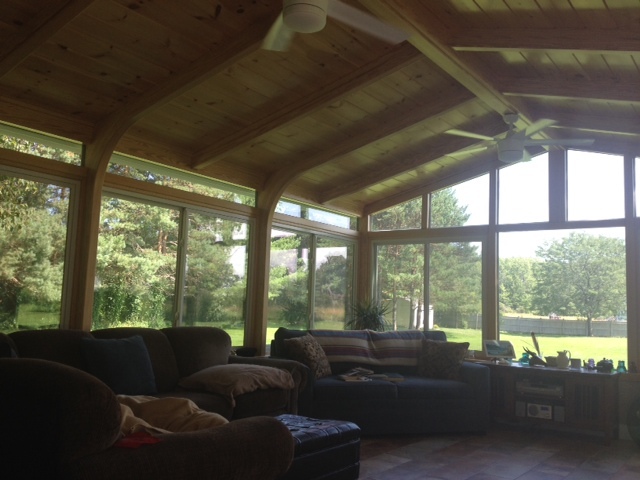 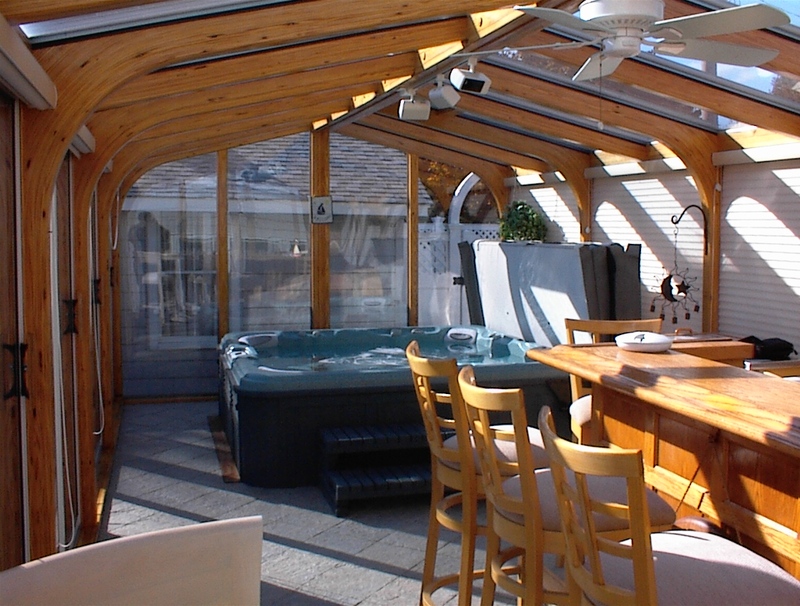 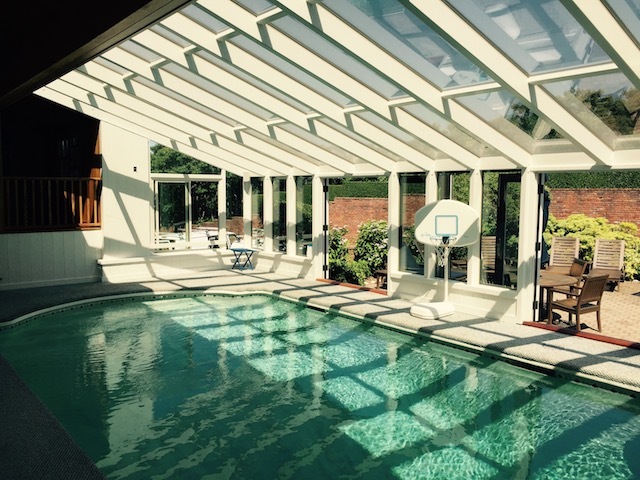 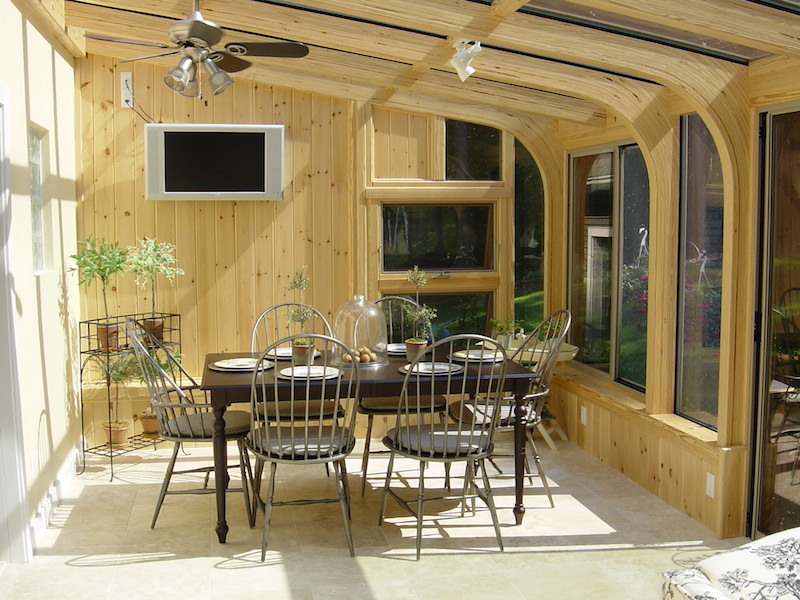 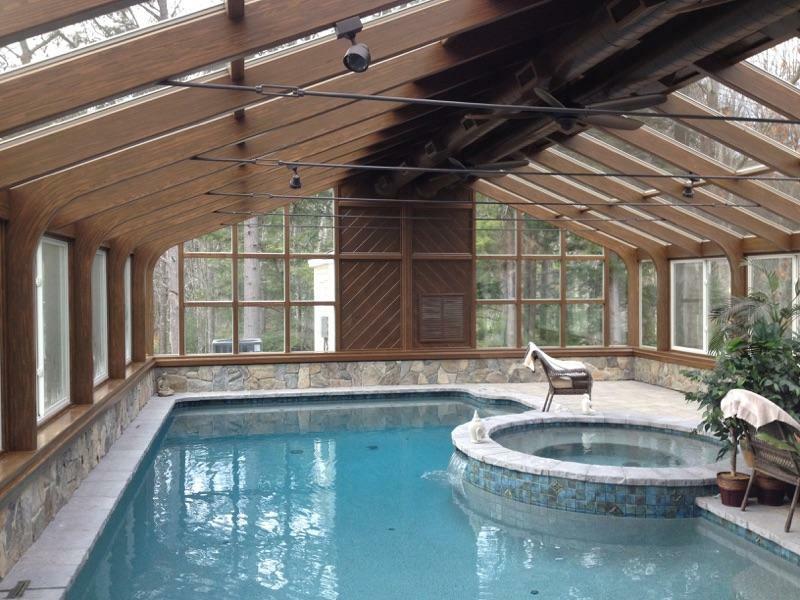 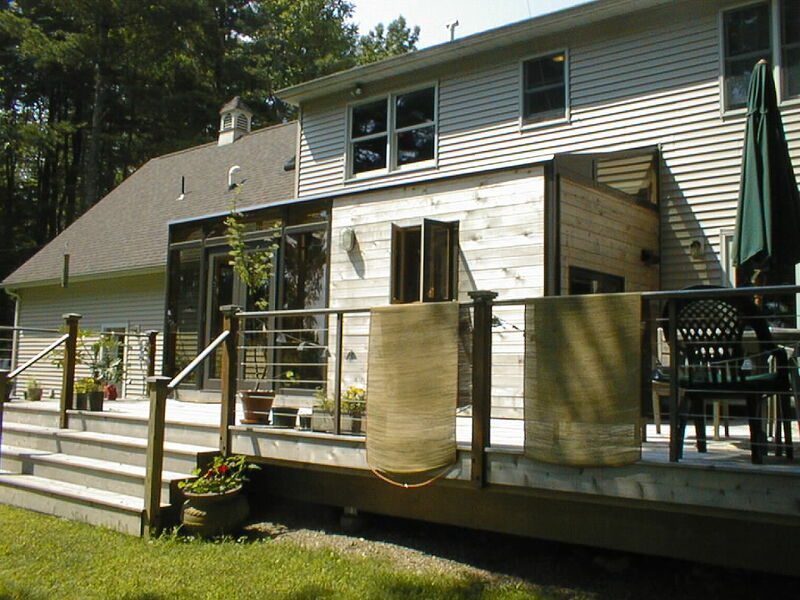 The southern pine curved beams provided a natural picture frame quality to the outdoor views. 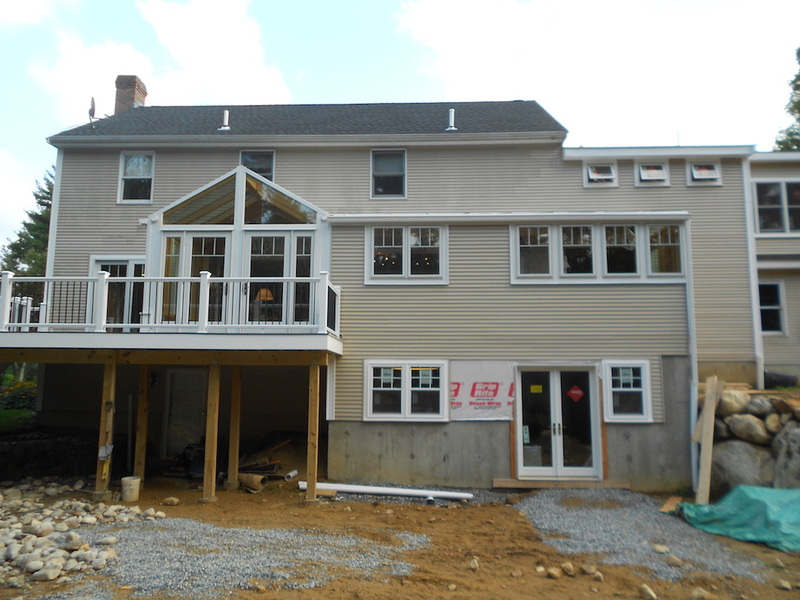 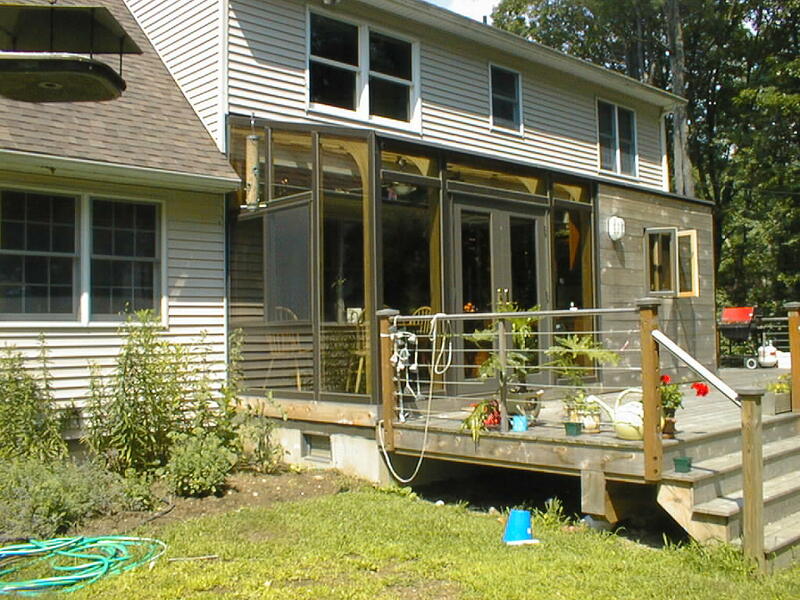 Adding numerous windows and glass makes it easy to watch the kids play in the backyard while working in the kitchen. 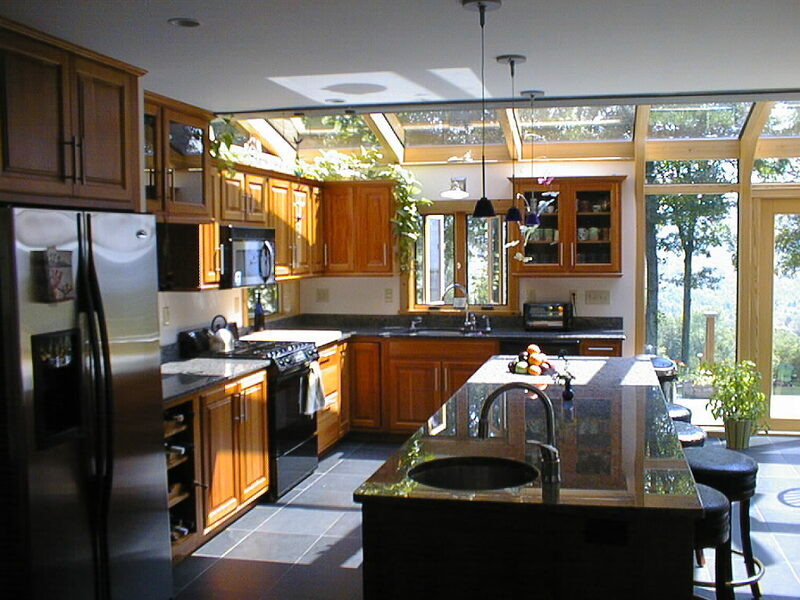 The open kitchen plan makes a great place to entertain and be social. 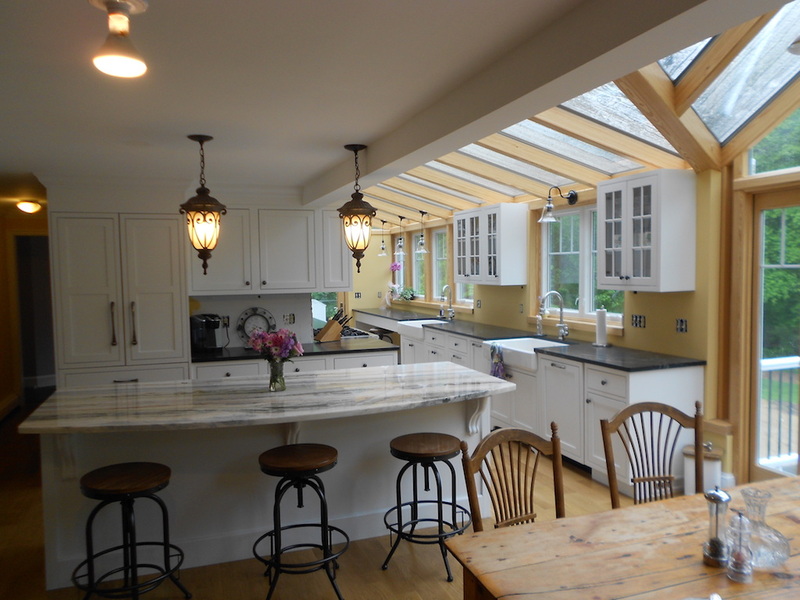 The kitchen area also features a dining area with a gabled ceiling providing an airy elegant atmosphere. 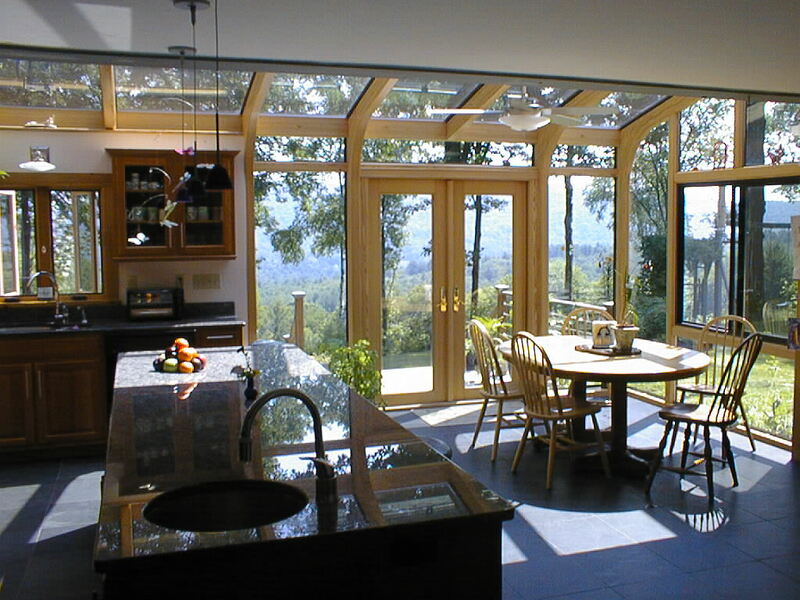 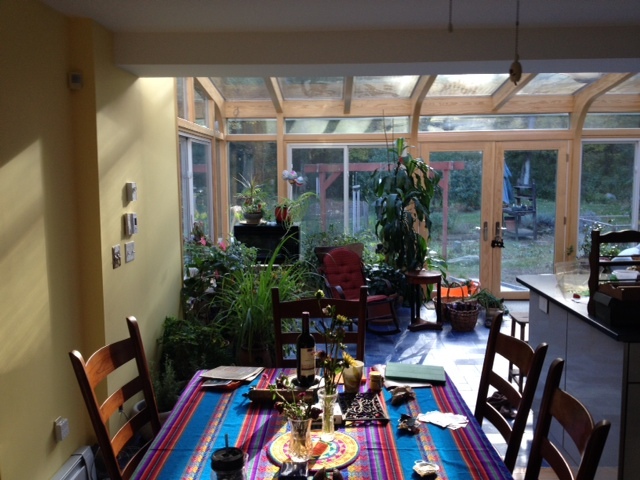 The glass ceiling and many windows add natural light to the kitchen and dining areas. 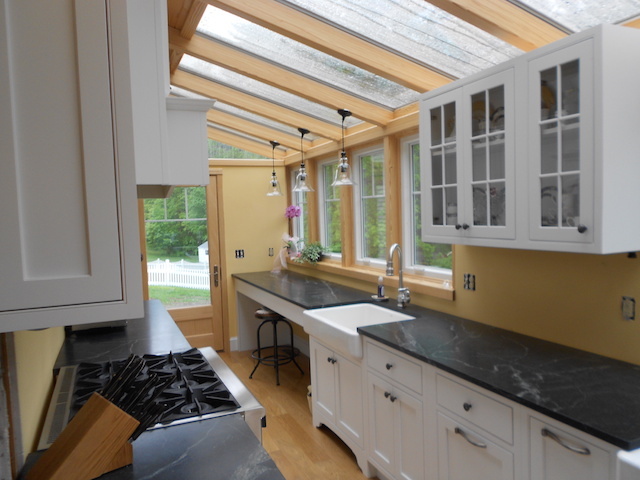 With two sinks, abundant countertops, and ample cabinet storage, the chef's dreams came true! 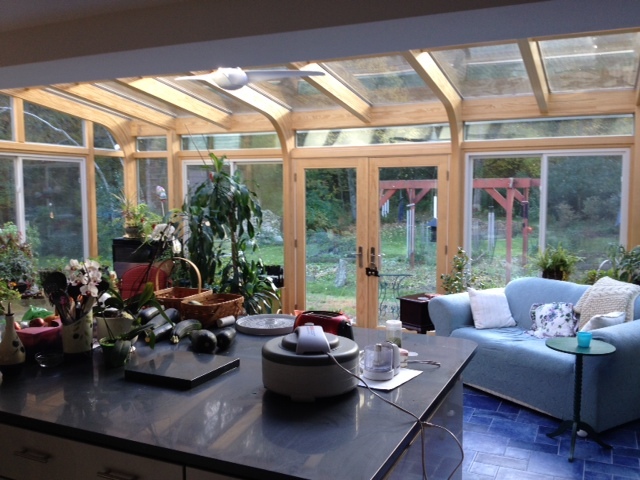 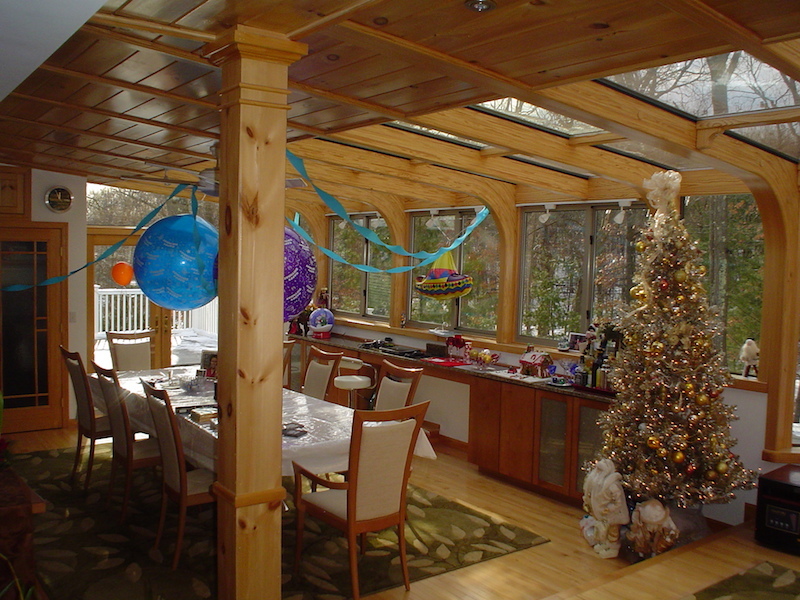 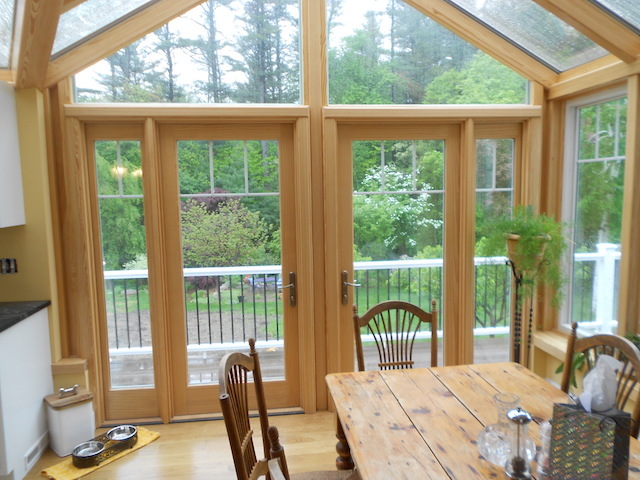 This sunroom bump out dramatically increased living space creating a light and airy kitchen with an ample amount of natural light. 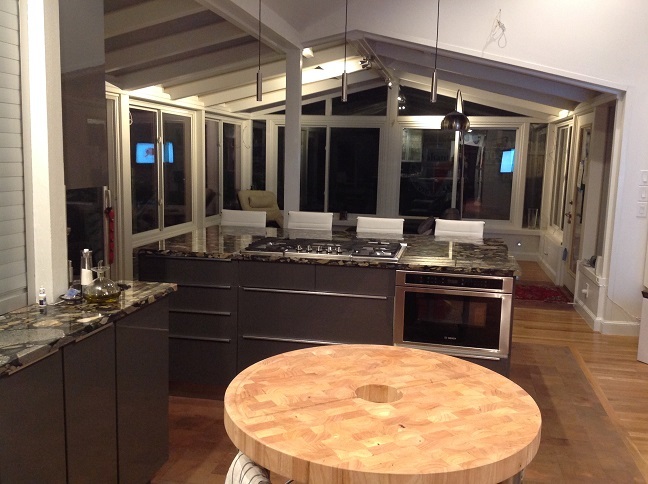 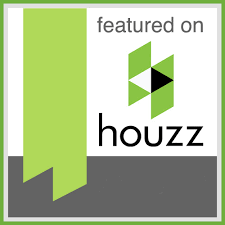 Our customer added light colored cabinets to give the kitchen a modern atmosphere. 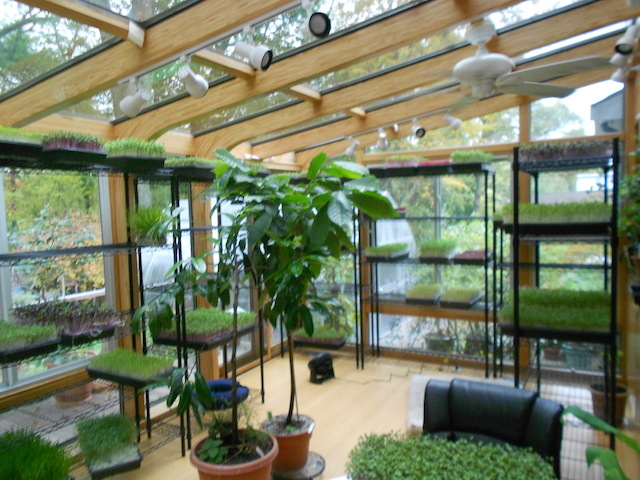 The indoor plants will also thrive in additional natural light flooding into the new space. 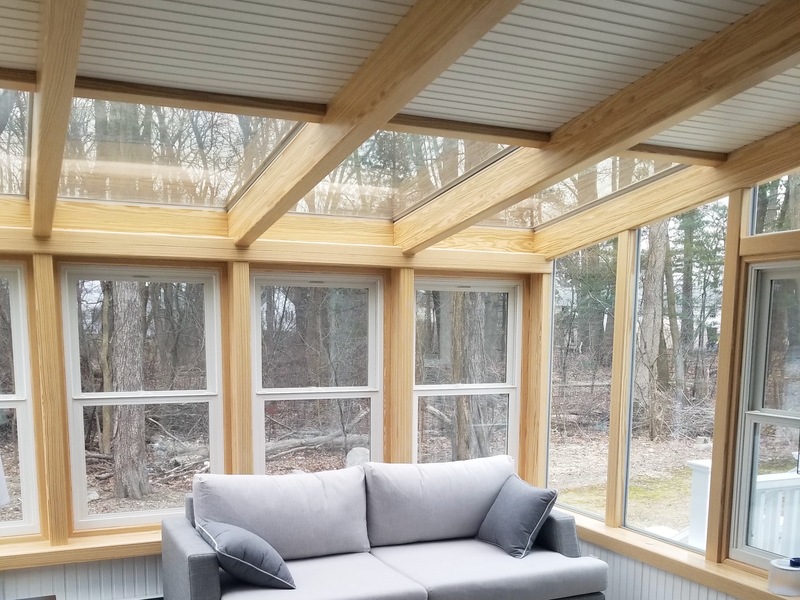 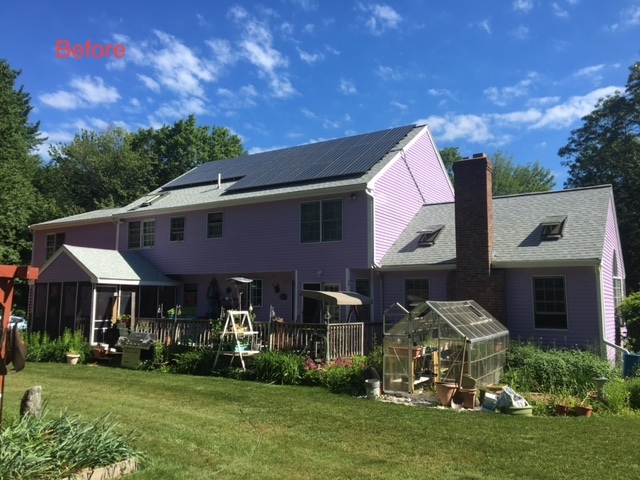 Adding numerous windows and glass makes it easy to watch the kids play in the backyard while working in the kitchen or lounging in the sunroom. 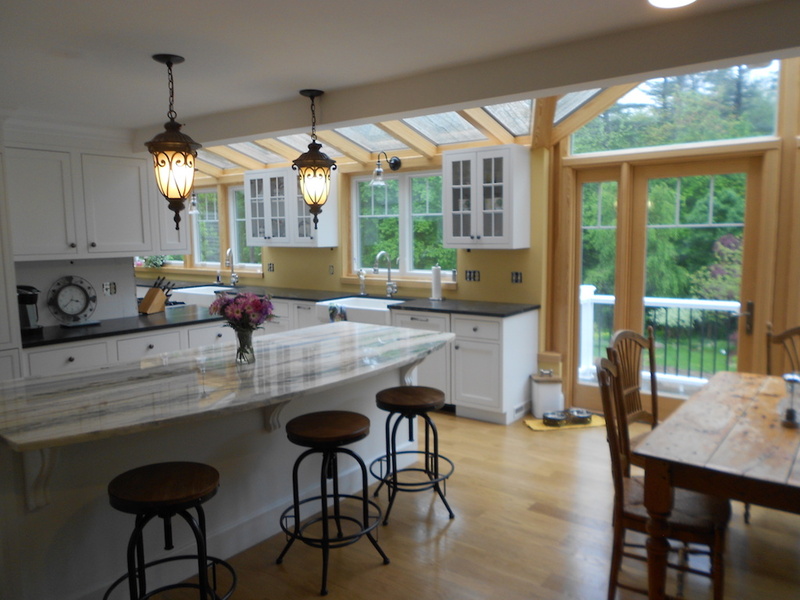 Adding a living space to the existing modern kitchen allowed this homeowner to incorporate entertaining space to the traditional kitchen area. 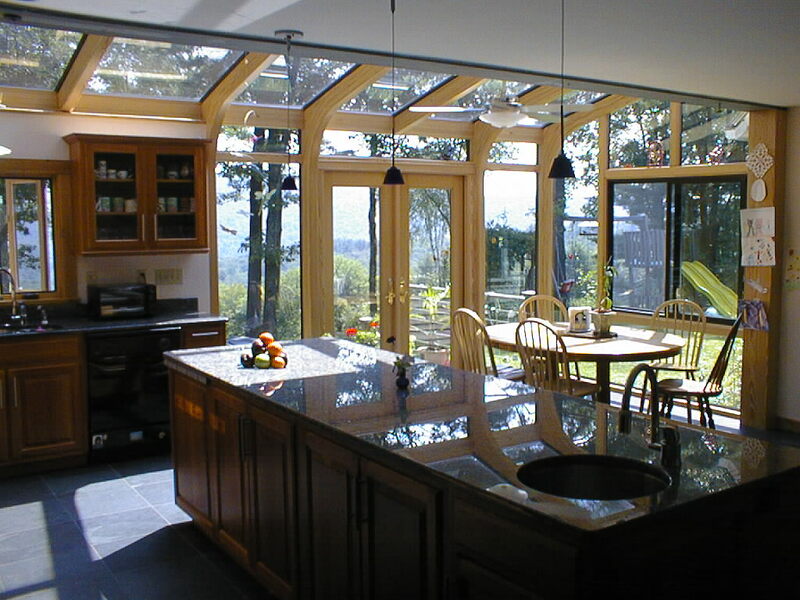 The kitchen is naturally lighted with floor-to-ceiling glass and windows. 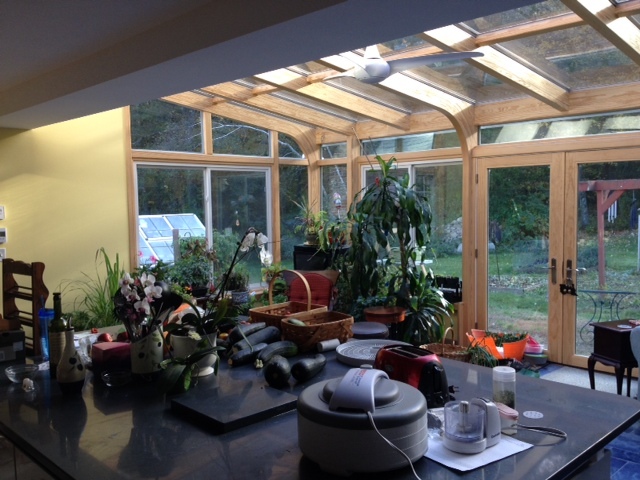 The living area has a gabled glass ceiling providing a modern atmosphere to compliment the styling of the kitchen. 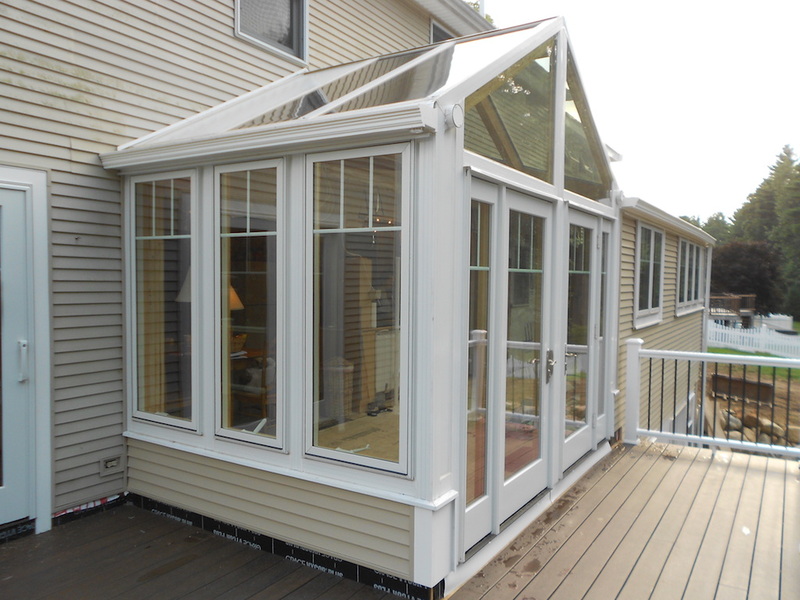 Built with pride to last a lifetime… our quality shines through.